Payment with VISA or MasterCard online is available 24 hours a day. NOTE: International customers CANNOT pay online. International customers can ONLY pay by phone at (651) 281-3219. Pay by PhonePayment with VISA or MasterCard by phone is available 24 hours a day. NOTE: If you are calling from a phone number with area codes 612, 651, 763, or 952, the (800) number WILL NOT WORK. If you are calling from a phone number with an international area code (including Canada), you must use the (651) number listed above. Please allow up to seven (7) business days from the date you received your citation for processing before calling. Include the ticket or the ticket number with your payment. Pay in PersonIf you would like to pay your fine in person, you must do so in the county in which your citation was issued. Fine amounts are no longer posted on the Judicial Branch Website because law library fees are set by each county and the total amount of fines can vary. A total fine amount is not available until after law enforcement files the citation with the court and it is entered into the Minnesota Court Information System (MNCIS), a process which could take up to seven (7) business days. To find the amount of your fine, follow the steps on the How Much Is My Fine page. How do I find my citation #? What if my citation doesn't look like this? What can be paid for online? Use the drop down menu below to find information about contesting a ticket in Hennepin, Ramsey or Washington counties. If you wish to contest a citation issued in a county other than Hennepin, Ramsey or Washington, please contact the local court for assistance. If you wish to contest a citation issued in a county other than Hennepin, Ramsey or Washington, please contact the local court for assistance. If you wish to contest a citation issued in Hennepin County, staff at the MN Court Payment Center are available to discuss the appointment options for meeting with a Hearing Officer. The MN Court Payment Center is available between 8:00 a.m. - 4:15 p.m., Monday through Friday. Press five (5) at the prompt for a Call Center Representative. set your case for arraignment. If a case does not settle with a Hearing Officer, a person has the right to ask for a court hearing. A person always has this right with misdemeanor offenses, however, if the offense is a petty misdemeanor, this right to a court hearing is waived if the defendant does not appear within 30 days as provided in MN Statutes § 169.91. On a first come first served basis, you may meet with a Hearing Officer at the Hearings & Fines Management office located on the skyway level of the Hennepin Co. Government Center in downtown Minneapolis. Call the MN Court Payment Center to schedule an appointment to meet with a Hearing Officer. Appointments are available at several District Court locations. *NOTE: Free parking is available at the suburban court locations. I have an appointment to meet with a Hearing Officer but now I cannot make it. What can I do? If you call MN Court Payment Center before the appointment, you may request a "continuance" (reschedule) to reschedule the appointment. If you cannot appear for your scheduled appointment, you must go to the Hennepin Co. Govt. Center location in downtown Minneapolis for a "walk-in" appearance. What should I bring with me to the appointment with the Hearing Officer? • Photo identification. A birth certificate is NOT an acceptable form of identification. • The actual disability permit, a photograph is not sufficient, if applicable. What happens in the appointment with the Hearing Officer? Check in at the front counter upon arrival at the hearing office at the Hearings & Fines Management Office. Check-in is not required at the suburban hearing officer locations. The Hearing Officer (not a judge) will review the citation(s), defendant’s violation history, court history, driving record and other information relevant to the citation(s) being contested, and will listen to the defendant's explanation of the circumstances. The Hearing Officer will explain the consequences of the violation(s), including fines. NOTE: It is not possible to have a trial with evidence at this meeting because a trial can only take place in court with a judge. The Hearing Officer will explain the guidelines for settling the citation(s) and will determine what options the defendant may have in his or her case. The defendant may ask questions about the options, but the Hearing Officer cannot give opinions or advice about the defendant’s decision. A plan is then made for the defendant to meet the terms of the settlement, and when all of the requirements are completed, the citation matter is settled. Can I appeal a decision made by a Hearing Officer? The decision of a Hearing Officer is usually the result of the discussion with the defendant about the citation and the possible options to settle it. If you do not like the decision, you may ask that the citation be set for court, unless you waived your right to a court hearing under MN Statutes § 169.91. That statute says that if you fail to appear for a petty misdemeanor within 30 days, you have waived your right to court and plead guilty to the charge. What happens if I pay my citation, but I have a hearing scheduled? If you have scheduled a hearing officer appointment, but decided to pay your citation prior to the appointment, please call the MN Court Payment Center at: 651-281-3219 (if calling from area codes 612, 651, 763, or 952) or (800) 657-3611 (all other area codes) to cancel your appointment. 2. Enter your citation number and click Search. 3. 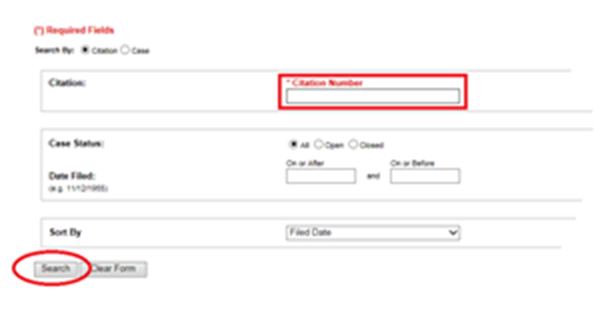 Verify the correct citation number is displayed and click on the case number. 4. In the Other Events and Hearings section, the word "CANCELLED" should be next to the hearing date. If you wish to contest a citation issued in Ramsey County, staff at the MN Court Payment Center are available to discuss the appointment options for meeting with a Hearing Officer. accept a plea of ‘not guilty’ and set your case for court. Call the Minnesota Court Payment Center to schedule an appointment to meet with a Hearing Officer. Appointments are available at two District Court locations. *NOTE: Free parking is available at the suburban court location. One hearing officer appointment continuance will be granted as long as you contact the MN Court Payment Center to reschedule your hearing officer appointment prior to your scheduled appointment. Photo identification. A birth certificate is NOT an acceptable form of identification. Check in at the front counter upon arrival at the hearing office. The Hearing Officer (not a judge) will review the citation(s), the defendant’s violation history, court history, driving record and other information relevant to the citation(s) being contested, and will listen to the defendant’s explanation of the circumstances. The Hearing Officer will explain the consequences of the violation(s), including fines. NOTE: It is not possible to have a trial with evidence at this meeting because a trial can only take place in court with a judge. Can I appeal a decision made by a Hearing Officer? The decision of a Hearing Officer is usually the result of the discussion with the defendant about the citation and the possible options to settle it. If you do not like the decision, you may ask that the citation be set for court, unless you waived your right to a court hearing under MN Statutes § 169.91. That statute says that if you fail to appear for a petty misdemeanor within 30 days, you have waived your right to court and plead guilty to the charge. If you have scheduled a hearing officer appointment, but decided to pay your citation prior to the appointment, please call the MN Court Payment Center (CPC) at: 651-281-3219 (if calling from area codes 612, 651, 763, or 952) or (800) 657-3611 (all other area codes) to cancel your appointment. The Washington County Violations Bureau is responsible for processing cases that are payable and/or do not require a court appearance. (Offenses that require a court appearance are handled by the Criminal Division.) Defendants who receive payable citations can either pay the ticket using the "Submit Payment" tab on this page (which constitutes a plea of guilty to all offenses) or see a hearing officer to negotiate a settlement of the case. The following is a description of the Hearing Officer Program. The Washington County Violations Bureau provides the opportunity to meet with a hearing officer at either the Stillwater Courthouse or the Washington County Service Center - Cottage Grove to attempt resolution of petty misdemeanor and payable misdemeanor cases. Hearing officers are available to review payable ticket offenses including parking, traffic, and some misdemeanors. Moving violations, driver's license suspensions, vehicle registration, and insurance violations are a few examples of cases which may be conveniently resolved with a hearing officer in lieu of a court appearance. Settlement options can include reducing the fine, keeping the offense off of the driver's record or, in some cases, dismissing the citation. The Violations Bureau will not handle matters requiring a court appearance, such as hit and run, underage drink and drive, driving while impaired (DWI) and theft charges. Mail to the address noted above, or fax to (651) 430-6300. The hearing officer will review the above and, if approved, a return letter outlining options and appropriate court document(s) will be sent to the defendant for signature. The defendant will then sign, have his/her signature notarized, and mail the completed document(s) to the hearing officer with a check/money order, if required. For questions regarding this procedure, call (651) 430-6279. Payable Option 1: Pay the fine in full. A plea of guilty to all offenses charged on the citation. Use the "Pay Citation" tab on this page for payment options. For more infomation on court debts that have gone to collections, visit the Minnesota Department of Revenue website or call (651) 556-3003. Notice of Surcharge: Per Minnesota Statute 357.021 Subd. 6, a state surcharge must be imposed on fines. Parking offenses $12, all other criminal and traffic $75. A charge of $30 will be assessed to all returned checks. Walk-in service (no appointments) Monday - Friday, 8:00 a.m. to 4:00 p.m. Learn more from the Hearing Officer Program Brochure. No Insurance/No Proof of Insurance: As of July 1, 2009, insurance charges became payable. However, if you provide a copy of your insurance card or policy which indicates that you had insurance for the vehicle you were driving at the time of the offense - and you provide this proof within 30 days of the date of offense - the charge will be administratively dismissed. The card or policy must show beginning and ending dates of coverage, and cannot be a bill or statement. It may be mailed, brought in person, or faxed. If you did not have or are unable to provide proof of insurance, the charge remains payable; however be aware that a conviction on an insurance charge is subject to ramifications from the Department of Public Safety. Contact the Department of Public Safety at (651) 296-6911 for more information. A Notice with your court date will be mailed to you at the address noted on your citation. If you have questions regarding your court appearance, call (651) 430-6279. Hit and Run; Underage Drink and Drive; Theft; charges involving an accident or endangering life or property (will be indicated on citation). Your first appearance in court: A first appearance is where you enter a plea of guilty or not guilty. If you plead not guilty, a pretrial or court trial is scheduled. If you enter a plea of guilty, you will be sentenced at that time. The court encourages you to resolve the matter at the first appearance, when the city or county attorney is present to discuss the facts of the case. There is also a public defender present for consultation on misdemeanor cases if you qualify for the services. In addition, the Washington County Criminal Defense Panel Program offers representation on cases at misdemeanor level or higher - call (651) 748-9373 for more information. This is a large volume court hearing, and you can expect to be at the court for several hours. If you are assessed a fine, you are expected to pay it before leaving or arrange a payment plan. If the charge is alcohol- or assault-related, you may be required to be assessed by the Corrections Department. You have a right to an attorney: If you are not comfortable representing yourself in court, you may want to consider hiring an attorney. An attorney is your representative in court. No one else you will see in the courtroom is rightfully entitled or obligated to protect your rights. If you don't think you can afford an attorney, but feel that you need one, you can ask the Court to appoint an attorney to represent you. This attorney is called a Public Defender. Public defenders are present at the courthouse and will assist you if you apply for and are granted one. You may request the Application Form when you check in for court, complete the form while waiting, and submit it to the Clerk prior to the start of court, or the Judge when your case is called. You will be assessed a co-pay of $75.00 if you qualify for the services. Failure to Appear Notice: If you fail to pay your fine or appear for the court date, additional penalties may be added. Extended delays may cause a warrant to be issued for your arrest or suspension of your driver's license. Petty Misdemeanor Offenders: Failure to appear in court on a charge that is a petty misdemeanor is considered a plea of guilty and waiver of the right to trial, unless the person appears in court within ten (10) days and shows that the failure to appear was beyond the person's control. The offender may be subject to a fine up to $300 and have their driver's license suspended (if the offense is a moving violation) until payment of the fine. M.S. § 171.16, subd. 3. Misdemeanor offenders: A person charged with a misdemeanor who intentionally fails to appear in court for trial on the charge after having been notified that a failure to appear for court appearance is a criminal offense is guilty of a misdemeanor and may be sentenced to imprisonment for not more than 90 days or payment of a fine of not more than $1000, or both. M.S. § 609.49, subdivision 2. All fines are due on the day they are imposed in court. If you need reasonable accommodations, an interpreter, or other assistance, call (651) 430-4422. If you cannot communicate by voice, phone our TTY number at (651) 430-6246. 1. How much is my fine? 2. What happens if I pay a citation? Payment of a fine, including partial payment, constitutes a plea of guilty and waiver of rights that will result in the entry of a conviction on all charges in the case. Convictions for certain offenses will be sent to the Department of Public Safety (DPS) for entry on your driving record, or to the Department of Natural Resources (DNR) , and may result in the loss of your license by those agencies. Paying the fine for driving after suspension, revocation, cancellation, and disqualification, or for no insurance or no proof of insurance offenses, may result in the loss of your driving privileges. Contact the MN Driver & Vehicle Services (DVS) at DPS or call (651) 297-3298 to check that your license is valid before you drive. If you've been charged with no proof of insurance or no insurance, be sure to read FAQ #5 'How do I show Proof of Insurance?'. 3. What happens if I don’t pay a citation? If you fail to pay, see a hearing officer, or appear in court on a citation, additional fees will be added and the unpaid citation may result in a suspended driver's license by the MN Driver & Vehicle Services (DVS) or the amount owed being sent to collections. You have 30 days to respond to a citation from the date it was entered into the Minnesota Court Information System (MNCIS). After 30 days, a $5 fee is added. After another 30 days, a "delinquency fee" of $25 is added. If the citation is for a traffic violation, it may result in a suspended driver's license. Other unpaid citations are sent to collections. NOTE: In Hennepin County, failure to pay five (5) or more traffic or parking citations may result in impoundment of your vehicle until the fines are paid. 4. What should I do if I cannot pay my fine, in full, by the due date? A payment plan that spreads the total amount due into six (6) equal payments over six (6) months if the total amount due is more than $500. 5. How do I show Proof of Insurance? If you are charged with No Proof of Insurance or No Insurance and the vehicle you were driving was insured on the date and time of the offense, proof of insurance documentation or the name and address of the owner of the vehicle must be sent to the MN Court Payment Center (CPC) no later than 30 days from when the citation is filed with the courts. Copy of the insurance policy. The information received must include the name of the insured, the name of the insurance company, the effective and ending dates of coverage, and the vehicle type. The insurance must be in effect on the date of the offense noted on the citation. Be sure to include your case or citation number, or a copy of the citation with the proof of insurance. Generally, after the proof is received it can take up to two (2) business days to process. If dismissed, no fine will be due for that charge. NOTE: If there are other offenses listed on your citation, do not pay at this time, as the total due may change. Look up fine amounts online or by calling the CPC. To check that your proof of insurance documentation has been received, you may call the CPC 8:00 a.m. - 4:15 p.m., Monday through Friday. Press five (5) in the menu to speak to a clerk. 6. Why was my driver’s license suspended? The Minnesota Judicial Branch sends a notification to the Driver and Vehicle Services (DVS) division of the Department of Public Safety (DPS), when fines and late fees remain unpaid on cases with traffic- or vehicle equipment-related offenses. The notification includes a recommendation that the defendant’s driver’s license be suspended until the citation has been paid. DVS is required to grant the suspension recommendation and suspend the driver’s license. If your license has been suspended, you may be required to pay a reinstatement fee to DPS before your license will be reinstated. This fee is paid directly to DPS, cannot be paid to the MN Court Payment Center (CPC), and is in addition to the fines and fees that are owed to the Courts. 7. What if I find out that I have citations on a vehicle that I don’t own anymore? You will need to contact the Department of Public Safety (DPS) to learn what your options are for transferring title into the buyer's name. You can also read the Car Title Help Topic to learn more about your options. NOTE: You still need to take care of your citation by paying the fine or calling the MN Court Payment Center (CPC) to see what your options are for contesting the citation. 8. Why was my citation sent for collections? Under Minn. Stat. § 480.15, subd. 10c, any portion of a fine, surcharge, court cost, restitution, or fee that you fail to pay by the due date may be sent for collections, and collection costs may be added to the amount due. You have the right to ask that it not be sent to collections based on an inability to pay by requesting a hearing or court date no later than the due date. 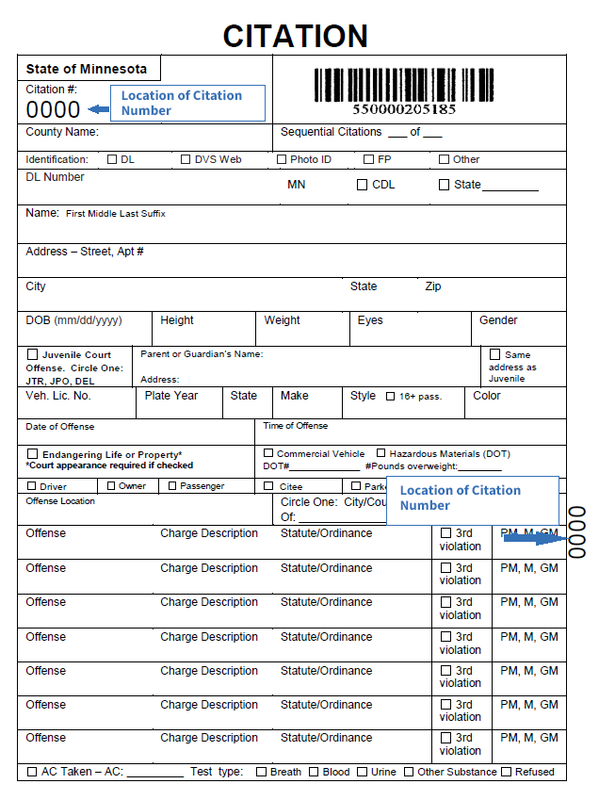 The due date is the “appearance date” or 30 days from the date of offense on the citation. Unpaid court or citation fines that have been sent for collections to the MN Department of Revenue (DOR) must be paid directly to the DOR and cannot be paid to the MN Court Payment Center (CPC) or the Courthouse. 9. I dialed the (800) number for the MN Court Payment Center (CPC) and all I get is a busy signal. How can I talk with someone? Check to make sure you are dialing the correct phone number. The (800) number will not work if you are calling from a phone number with area codes 612, 651, 763, or 952. If calling from any of those area codes, you must dial: (651) 281-3219. E-mail support is not available. 10. If you have not received a citation but want to report a defective meter in Hennepin County. For city of Minneapolis, you can report Minneapolis parking meter problems online or call 311. For University of Minnesota meters on the Minneapolis or St. Paul campus, call (612) 626-7275. For problems with parking meters in other Minnesota cities, contact the city or town where the meter is located. 11. I paid an electronic parking meter in Hennepin County and still received a citation. What do I need to do? You may check the status of the citation online or by calling the MN Court Payment Center (CPC). NOTE: If you paid for the wrong space number, you will need to pay the fine or call the CPC to schedule a Hearing Officer appointment to contest the citation. 12. I received a parking citation in Ramsey County but the parking meter was defective. What do I need to do? For meters on the U of M St. Paul campus, call (612) 626-7275. For meters in the State Capital area, call (651) 201-2300. For meters anywhere else in Saint Paul, call (651) 266-9776. 13. I paid to park at a multi-space pay station in Ramsey County and still received a citation. What do I need to do? NOTE: If you paid for the wrong meter space, you will need to pay the fine or call the CPC to schedule a Hearing Officer appointment to contest the citation. 14. What is a payable offense? Placement on a county payables list. All petty misdemeanor violations of statute and administrative rule are payable, per the Judicial Council policy (petty misdemeanor offenses are payable even if not expressly identified on a Statewide Payables List). NOTE: A citation is only payable if all offenses included on the citation are payable offenses. 15. What is a Mandatory Court Appearance Required Offense? Any otherwise payable offense if the "Endangering Life or Property" box is checked on the citation or the case is charged by complaint or petition. 16. What is the MN Court Payment Center (CPC)? The Minnesota Court Payment Center is a statewide operation in the State Court Administrator’s office in the Minnesota Judicial Branch with responsibility for processing citations and traffic tickets from case initiation through disposal in all of Minnesota’s 87 counties. The Minnesota Court Payment Center (CPC) was established in 2009 as a means to streamline the processing of citations, offer cost-effective, convenient and alternative methods of service delivery, and mobilize technology and automation that speeds up the processing of payable citations and traffic tickets. Questions about your citation? E-mail support is not available. Call between 8:00 a.m. - 4:15 p.m., Monday through Friday. Press five (5) at the prompt for a Call Center Representative. Please have a pen and paper available when you call. Several factors, such as the number of cases and the difficulty of a caller’s questions may add to the length of a call; however, on average, call length is less than three (3) minutes. Peak call times include the first business day after a holiday weekend, Mondays, and daily over the lunch hour from approximately 11:30 a.m. to 1:30 p.m.